So you want to learn how to make yourself popular, do you? Well, everyone says money can’t buy you love or friendship or happiness. True, but money can buy you all the things you need to make lots and lots of cookies. Which is basically the same thing. Make these and everyone will love you. You’ll be the coolest kid in school with a million friends, that one person everyone wants to be. This is a piece of advice I wish I had known in my middle school days… When I have a daughter going through her awkward preteen years, I will teach her to make these cookies. They’re ridiculously impressive, but much simpler to make than they look. I’m not going to lie and say they’re easy, but you don’t need any special skills or tools. Just a few hours to kill. I used the recipes for the cookies and icing from Bake at 350 just like when I made my Android cookies. If it’s not broken, don’t fix it, right? 1. Start by mixing your colors. 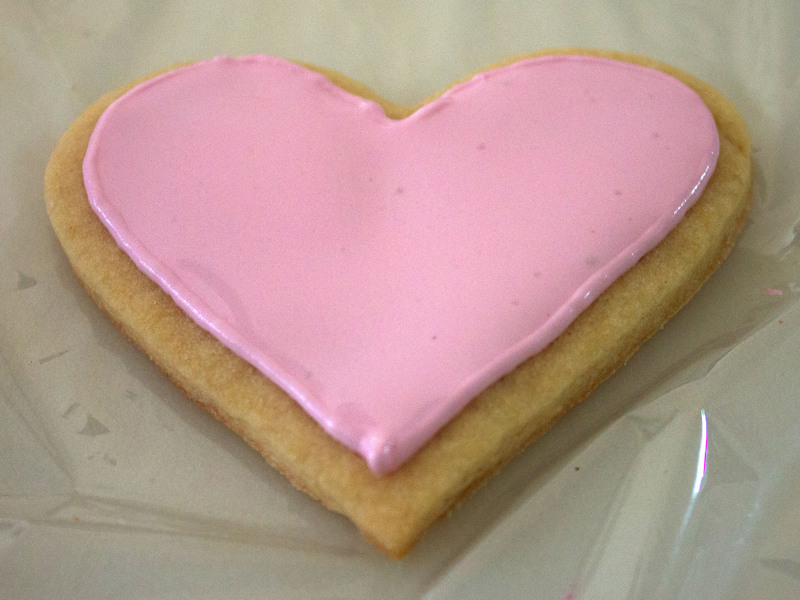 Take about 1 cup of icing and mix to your accent color. Do not thin. Transfer to a piping bag fitted with a #2 tip (you could use a #4 if you want your stripes to be thicker). 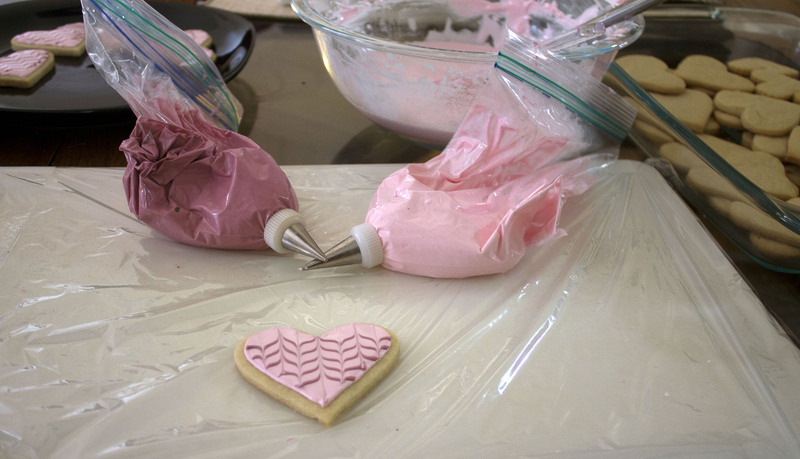 Then mix the remaining icing to your base color. Transfer 3/4 cup to another piping bag with a #2 tip. Thin the remaining icing. 2. 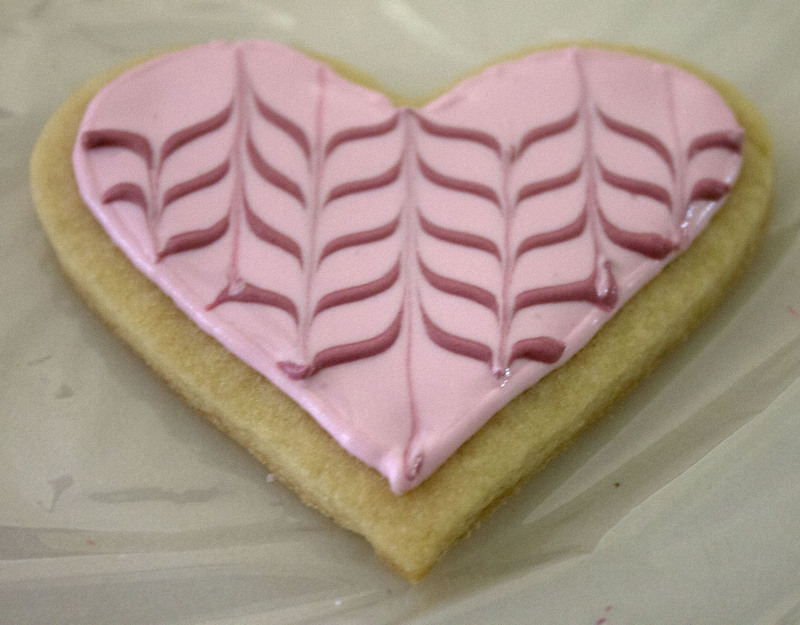 Outline your cookie in the base color using the thick icing. 3. 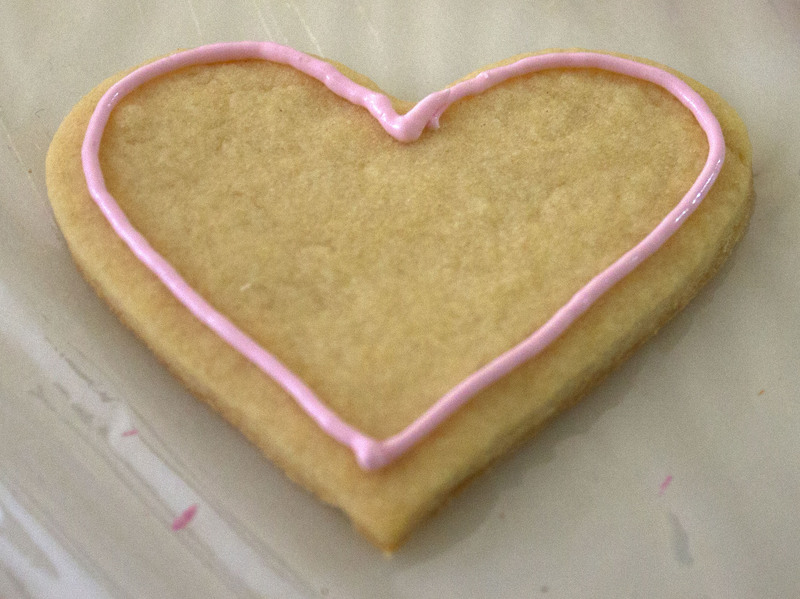 Fill cookie using thinned icing. Bake at 350 recommends using a squeeze bottle to do this, but I prefer just spreading it with a butter knife. 4. Pipe horizontal lines with your accent color. 5. Run your toothpick or knife lightly up and down through the stripes to create the pattern. 6. 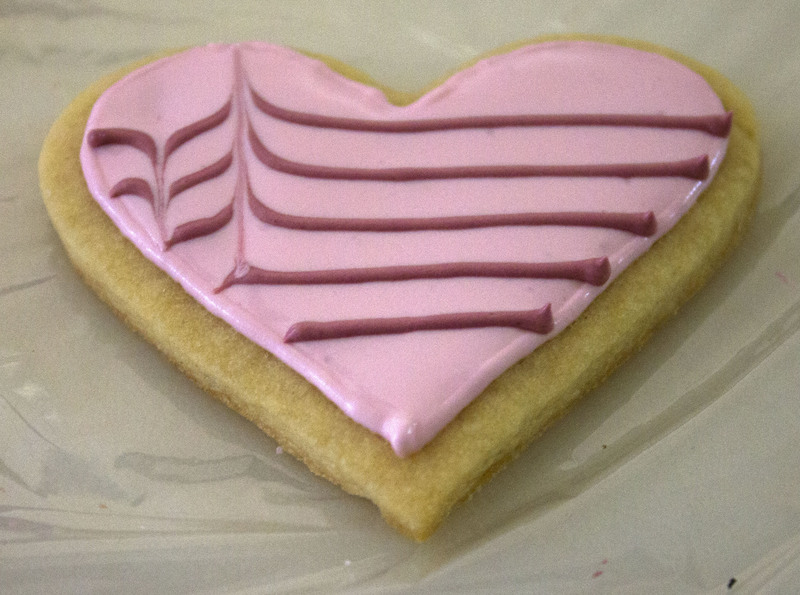 Continue moving back and forth until you have a beautiful cookie! Let the icing dry for a few hours before serving. 1. Once you get the hang of it, you can do more than one cookie at a time to make things go faster. I can handle about 5 at a time before I get overwhelmed. 2. You will probably make a big mess all over your table. Tape down some plastic wrap over whatever surface you’re working on and save yourself some scrubbing! 3. If it’s not perfect, probably no one besides you will notice. 4. If you mess up, you can wipe away the icing and try again. If it’s unsalvageable, don’t get upset. Just remember that it’s only a cookie. Eat it and you’ll feel better. 5. 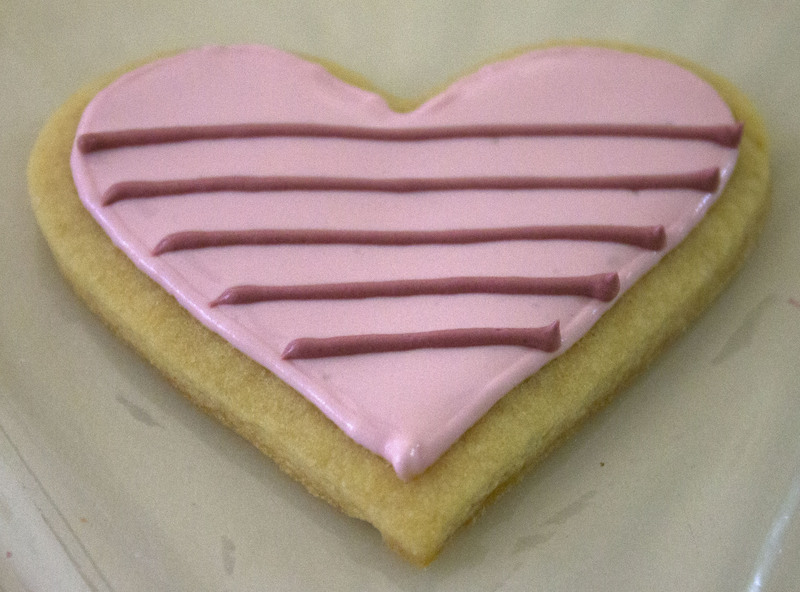 This design can be done on any shape cookie in any color for any occasion. Get creative! 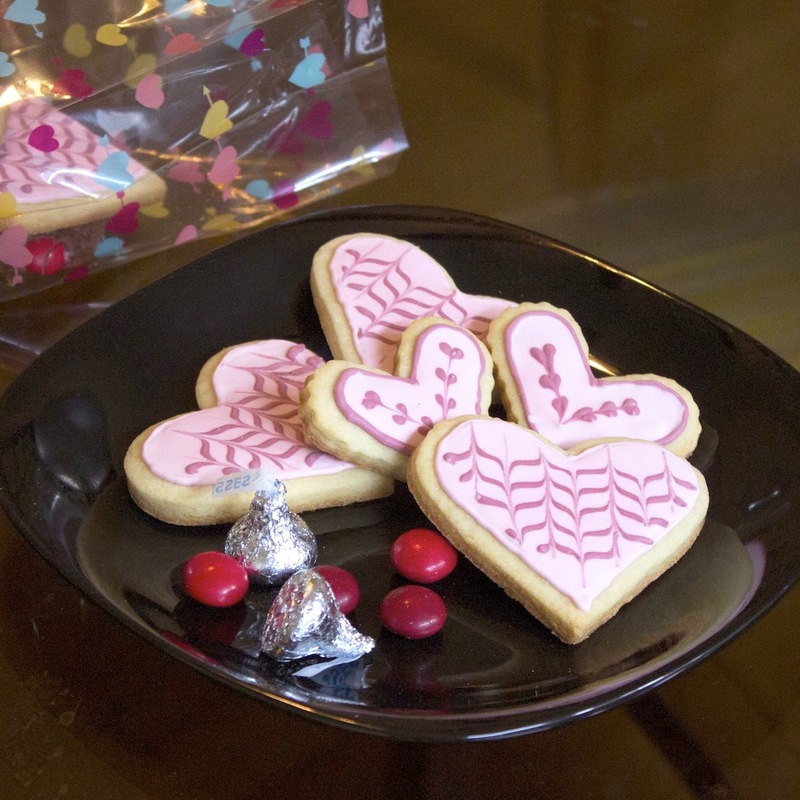 Get out there, make some cookies, and pretty soon you’ll have a million people dying to be your Valentine. 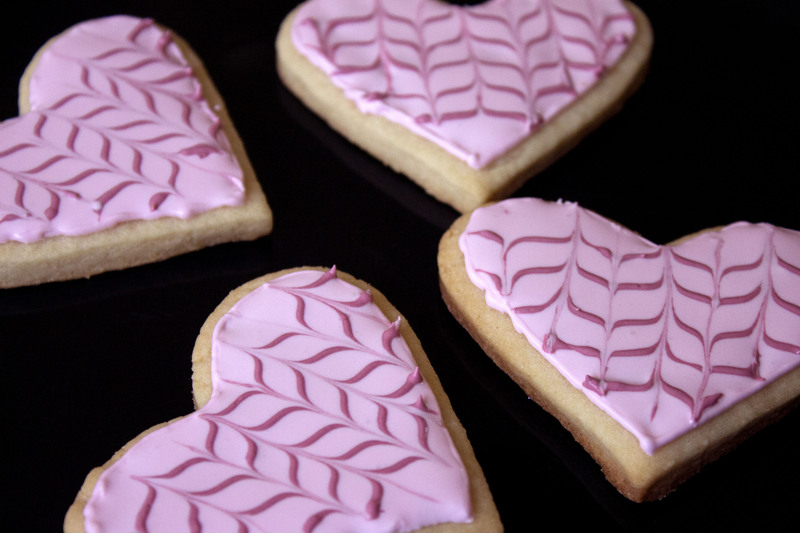 Or make them for the Valentine you already have! The love for you will be overflowing, I promise. 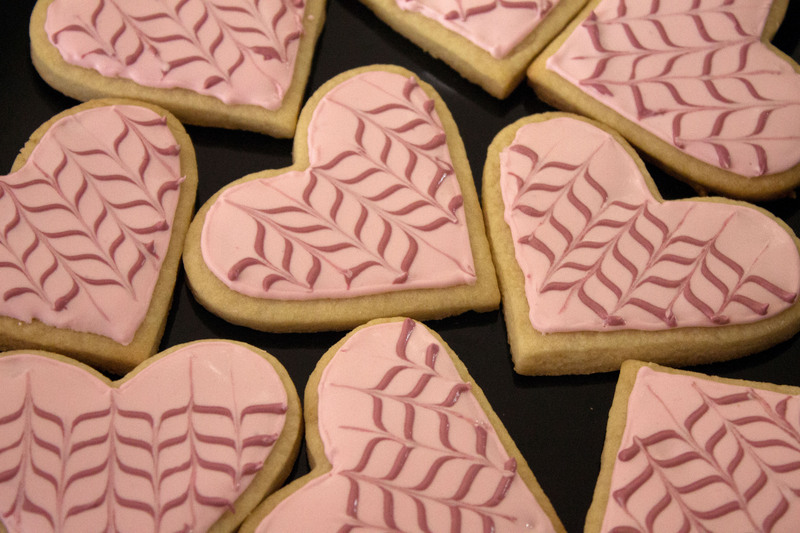 This entry was posted in Cookies, Dessert and tagged decorating by Alyssa G. Bookmark the permalink.